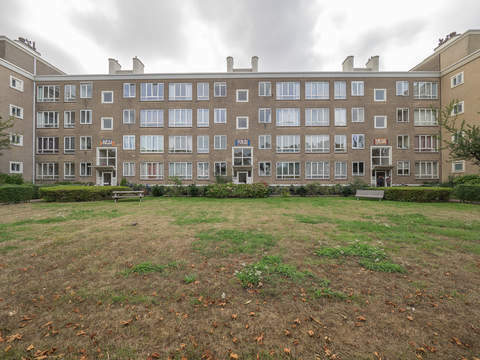 De Savornin Lohmanlaan 93 Price asked € 315.000 k.k. Beautifully renovated 4-room ground floor maisonette with unobstructed views of the Bosjes van Pex, front and back balcony, 3 bedrooms and within walking distance of the beach. Entrance via the gallery, vestibule with draft separation almost entirely of glass, modern toilet with hand basin, cozy extended living room approx. 6.11 x 4.55 as part of the hallway is added to the living room, bio ethanol fireplace, 2 built-in cupboards, French doors to balcony approx. 4.15 x 1.50 at the front with a view to the Bosjes van Pex. Modern open plan kitchen approx. 4.22 x 2.09 with L-shaped kitchen and white composite worktop, 5-burner gas cooker, oven, fridge / freezer with 3 drawers, dishwasher and 1 1/4th sink. Landing, built-in cupboard with washer / dryer connection, front bedroom approx. 3.10 x 1.86 currently classified as dressing room with built-in wall cabinet, bright front bedroom approx. 4.06 x 2.60 annex balcony approx. 2.34 x 0.75. Intermediate luxury bathroom approx. 2.94 x 2.04 partly 1.40 beautifully tiled with wooden bathroom furniture, toilet and walk-in shower, quietly located master bedroom approx. 4.55 x 3.25 also adjoining balcony approx. 4.55 x 1.15 facing southeast and overlooking the courtyard. Storage approx. 4.34 partly 2.85 x 2.00 in the basement. Situated on eternal lease-hold land conform the obligatory contract. The rent charge is € 607,60 per year, based on a land value of € 19.600,-- and a rent rate of 3.1%. Review rent rates by January 1st, 2020. Real estate tax 2018 € 119,40 per year. 16/540th share in the community. Active Owners Association, contribution € 148,-- each month as from the 1st of January 2019. The whole apartment is new doors on the inside, balcony doors and wide laminated flooring. The volume of the apartment approx. 301 m³.